Welcome to Markplex tutorial 100 in this collection of tutorials designed to help you learn TradeStation EasyLanguage programming skills. Please join our email list if you have not already done so and we will let you know when we release new tutorials or programs. This tutorial applies to TradeStation (but not MultiCharts). If you are interested in using the Optimization API with multiple data streams (i.e Data2, Data3 etc), I have written some training materials, including demonstration programs here, available to Gold Pass members. The tutorial 100 app. The green bar displays the progress of the optimization and the number beneath the buttons show the best net profit so far in the optimization. One of the exciting new features of TradeStation 9.5 is the new Optimization API. This API allows you to perform powerful new kinds of optimization – over multiple symbols, multiple intervals and more. TradeStation has produced some excellent documentation and training materials to accompany this new feature. Tutorial 100 demonstrates how to create a simple trading app to optimize two strategies across multiple symbols and bar lengths. 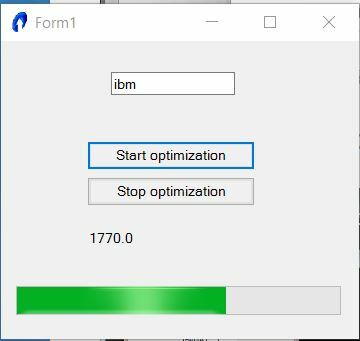 I also demonstrate some of the features of forms to show the progress of an optimization and to allow the user to specify the symbol to be optimized. I anticipate that there will be many trading apps available based on the optimization API, however it is sometimes useful to be able to create something very simple to meets your specific needs. This tutorial program (a version similar to those demonstrated in videos 1 and 2) is available for immediate download for only $19.95. For best results, watch these videos in full screen HD mode.